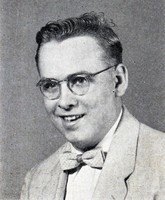 Frederick D. Smith, died Sunday Feb. 23 (1997), in his home. He was employed by James River Corp. - Dixie Products Group in Forks Township for over 40 years. Born Dec. 14, 1938, in West Easton, he was a son of Nelson P. Smith of Wilson Borough and the late Loretta Buther Smith. He and his wife, the former Earlene Evans, observed their 35th weddibg annaversity on Sept. 29, 1996. In addition to hia wife and father, he is survived by a brother Robert P. Sr. of Wilson Borough; two sisters, Shirley Border of West Easton and Betty Miller of Palmer Township; a niece and two nephews. Services will be held at 11 a.m. Wednesday from the Strunk Funeral Home, 2101 Northampton St., Wilson Borough. Call 7 to 8:30 tonight in the funeral home. Burial will be in Northampton Memoral Shrine in Palmer Township.